A tap on the Sort button in the main SafePages view switches to Sort mode. See Section 3.3, “SafePages”. In sort mode pages can be rearranged and deleted. This screen shows the result after some editing. One cut page is shown with a red border. Notice the mini scissor icon at the bottom of the screen, showing the page number of the cut page. One selected page is shown with an orange border. The footer bar shows a scissor icon with a page number of the cut, and a pin icon with the page number of the selected page. A tap on a single page will (un)select it. A tap on an aggregated page will expand it. Aggregated pages are described at Figure 3.11, “User Web App: SafePages - Aggregated”. More actions : shows a pop-up with more actions (see below). More actions pop-up : pop-up with more actions. Selected pages are transferred to the PDF and Print dialog. Unselect all : unselects all selected pages. 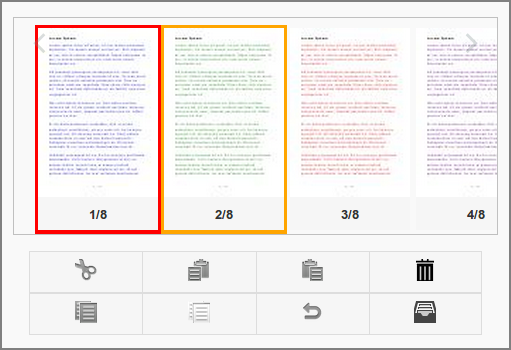 Selected pages that are in view are marked with a orange border. The mini pin icon at the bottom of the screen shows all selected pages. Cut : cuts the selected pages into the clipboard. Cut pages that are in view are marked with a red border. The mini scissor icon at the bottom of the screen shows the cut page ranges in the clipboard. Undo : reverts all cut actions and empties the clipboard. Left Paste : pastes the cut pages before the first selected page. Right Paste : pastes the cut pages after the first selected page. Delete : deletes the selected pages. Inbox : returns to the Main view. By default a fixed button text is shown on mobile devices only: on desktops a hover text is shown. See Section 3.3, “SafePages” on how to change this behavior. After SafePages are sorted any Fast Print will fail and all SafePages will be cleared as a result. Please use a Hold Print instead.